There are actually some truly unique twin cribs, double bassinets, and play yards available on today's market. Though some are hard to find or discontinued, there always seems to be new options cropping up. We will go over this diverse group so you can get a good idea of what each one features as well as what you can expect to spend (they are generally more costly than a single crib). Having a special crib for twins might make all the difference to some parents, and knowing what’s out there may help with planning a double nursery ahead of time as well addressing the co-sleep decision. We will also provide a bit of information on twin bassinets. Be sure to scroll all the way down, as we cover a lot of options! 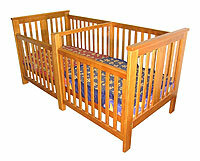 Another crib we will talk about is the popular, Little Miss Liberty Duetta Crib Mate Twin Round Wood Canopy Baby Crib. 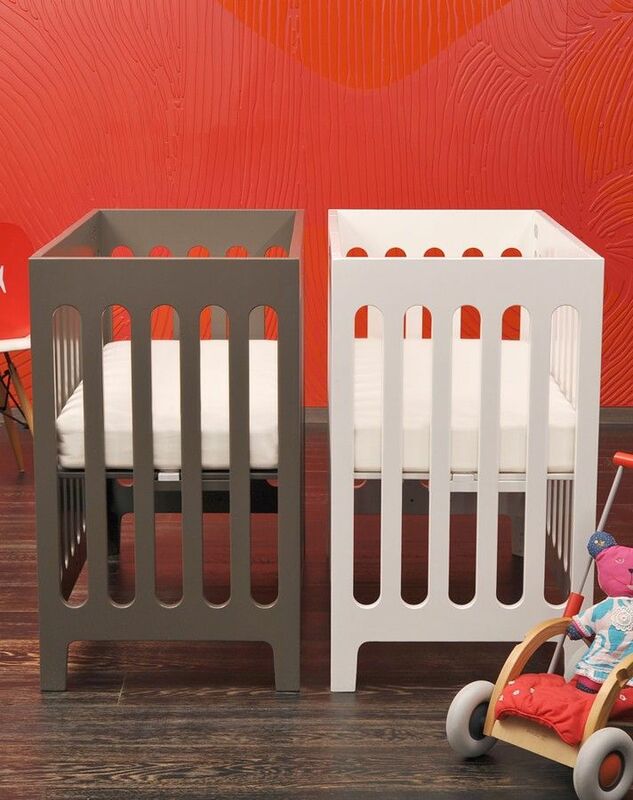 Two round cribs are designed to connect for an adorable twin crib that truly makes a statement. It features four different canopy configurations, and the two mattresses are included as well. You will likely need a bit more space for this set up given that it’s really meant to be in the center of the room (or at least away from the wall). So far, I have found the average price to be around $3,000. Keep in mind you will have to buy bedding, as well. 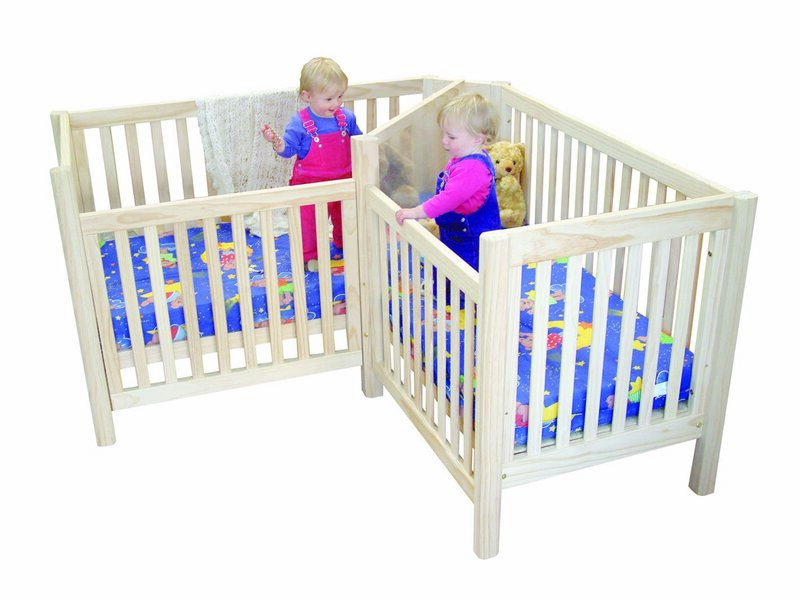 There are two different configurations of a great twin crib (called a twin cot) made by a company called Pamco. They offer the award winning Corner Cot for twins which will accommodate your babies from infancy to about 5 years of age. This cool design also converts to a sweet little corner sofa with the additional kit. The other design is their practical Twin Cot which is essentially like having two cribs put together end-to-end. It may also be converted into two twin size beds with an additional kit. You can count on paying around 650 GPB (United Kingdom Pounds), or $1,329 USD for the corner cot (not including conversion kit). And you’ll pay around 599 GPB, or $1,224 for the twin cot (not including conversion kit). They will ship overseas if you don’t live in the UK, but you will need to contact them. *We have been told that the company may open a warehouse here in the U.S.A. at some point, so we'll keep you posted! Net Kids Wear used to offer the innovative Twin Bunk. It has a fabulous, space-saving, twin bunk design. When you have limited space for your twins, this may well be a handy choice. 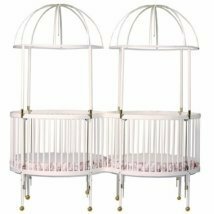 You used to be able to acquire this clever twin crib for about $700 plus $150 in shipping - we're pretty sure it has been discontinued at this point, but wanted to include it because of the interest from our readers. 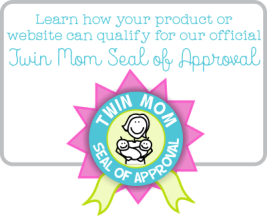 Click to see this twin nursery project. 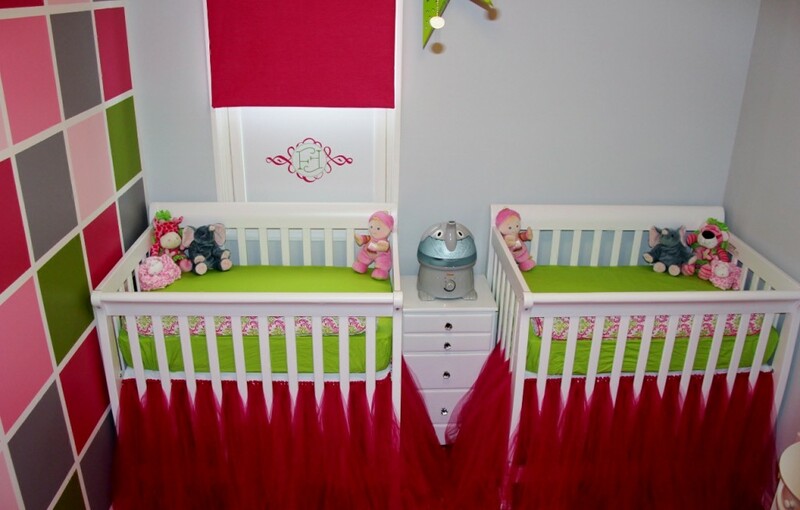 Yet another bright idea is to just get two Mini Cribs (photo shown is courtesy of projectnursery.com). They come with standard features of regular cribs, but they are much smaller and lighter, making them great space-savers. A good value, some models can also be converted to twin beds (conversion kit sold separately) to accommodate your growing twins. At around $100 - $250 or so a piece, they may well be the best bang for your buck. They're a little on the pricey side at around $340 a piece. But their cool, modern design and colors along with the ability to fold up for storage make them very enticing for parents of multiples living in small spaces. 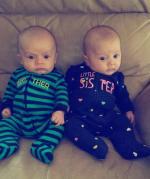 While your twins are very young you could simply have them co-sleep in one standard crib. This is possible with a crib spacer or divider. It may be an affordable alternative, but can generally only be done for the first few months. This particular spacer (shown) is by the Leachco brand. You may even decide to go with this sleep option even if you have two cribs because twin babies often sleep more soundly when they're together. Next up - Twin Bassinets and Play Yards! Twin Playards and double bassinets are becoming an option that works great during the early months. Check out our helpful guide.